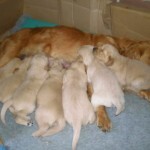 Working Golden Retrievers available in West Sussex. There is a fantastic litter of Working Golden Retriever puppies born in West Sussex sired by our Working Golden Retriever stud dog Haddeo Thesfus Of Fallowfen “Flint” . Both parents are from fantastic working lines with single digit hip score’s. 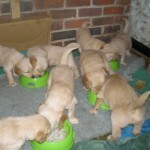 These puppies should make fantastic working companions or biddable family pets. Their pedigree contains some famous kennels which include Holway, Earnsfield, Abnalls, Standerwick and Rossmhor. 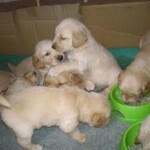 If you would like any further information or updates on this fantastic Golden retriever litter please contact Karen and Trevor on Tel: (01903) 882675 Mobile: 07831 599328.